Yes! It’s the religions who are at war, but the whole world, Revelation 12:9, is suffering sickness, hatred and death. Yahweh’s Prophet Isayah, in speaking of all God worshipping religions, said this sinful world has rejected the Righteous, guiding Words of Wisdom from the Creator, Yahweh. In so doing, they are totally blind to the way of achieving Peace with their neighbors and between nations. The Word of Yahweh to the religions, is to repent and convert to practicing Righteousness, or you will destroy yourselves in the lake of fire you are creating for yourselves. Pay close attention to Isayah’s Words and compare them to the nations’ problems, which have been brought on all nations by their religions and their Gods. Yes! Gods! Come and I will show you. You need to read this whole article if you want to know the cause of the world’s problems. Those three verses show the religions are cut off from the Creator and the great Wisdom that Yahweh offers to mankind, for which mankind was created. Verse 8: Yahweh could show the whole world the way to Peace. As it stands now, the religions, 4,199 of them, belong to Satan. Please read it for yourself in I Yahchanan 3:4-10 and Romans 6:16. This shows the religions are lying like Satan. Yahweh created mankind for the purpose of making mankind into His own Likeness of Righteousness, and His Image of having a body that can enjoy daily life, as well as Life Eternal. In that Plan is Life; that is, Eternal Life, if you repent of sin and convert to Yahweh’s Righteousness. Notice verse 5. The darkness does not take hold of this Tree of Life. How does one take hold of the Tree of Life? The first thing you must do is repent of God worship. Did you notice Yahchanan 1:5? The 4,199 religions miss the fact that the Gods are evil. The religions, all over the world, worship Gods and that cuts them off from the Creator and Life. All religions practice evil like the Gods. They are all cut off from Life and the great wisdom of how to live in Peace. Wow! But all religions of the world worship Gods. Yes! Your bible says the whole world is deceived, and it started in the beginning when mankind would not take hold of the Light of Righteousness. Remember the Light of Righteousness. What is the Light of Righteousness? All have sinned and come short—did not take hold—of the Light (Instruction) of Yahweh’s Laws. None of the religions in this generation is practicing Yahweh’s Laws. Even if you have no religious affiliation, you still follow the religious practices and teachings that have deceived the whole world, and are part of the worldwide murderous, religious system. Yes! The war-raging religions are responsible for all the atrocities commonplace in the world today. You must repent, or you will perish with the tree (religions) of iniquity. Read the Savior’s Words and believe them. You are a fool, says the Savior, if you do not believe. Notice, you must do more than just repent; you must convert. Your sins are not blotted out by the Blood of Yahshua until you repent and convert, to what? Did you notice that until you repent and convert to Yahweh’s Light (Righteousness), you belong to Satan and her Gods? Read again. He who practices sin is of the devil, for the devil has sinned from the beginning…. In verse 5, please don’t miss the lesson; most do, and continue to worship the serpent. In so doing, they belong to the system of Satan—the house of the Gods—not Yahweh. Now get what verse 5 is saying – evil like the Gods. Until you repent of sin (the breaking of Yahweh’s Laws) and stop obeying Satan (evil like the Gods), you belong to Satan and the Gods. Until you repent and start practicing Righteousness, you are on your way to perishing. In This Last Generation, In These Last Days, Where Does One Go? Those wars have already started. All religions are involved and they all think their God or Gods will save them from death and destruction. But these wars will turn nuclear; they will darken the sun and burn the earth. Did you notice the cause of these nuclear wars? The cause is the religions. Verse 2: priest, evil like the Gods, practicing sin/ transgression. Verse 5: they even change the Everlasting Covenant—the Seventh Day Sabbath meetings with Yahweh at His House. Verse 6: Because of this, they will use their nuclear bombs to murder the other religions, but in trying to murder the others, they will murder themselves in the process. Read on: Last Days—The End! This generation started in 1934. We are in the end now when the evil like the Gods will all go to nuclear, which will darken the sun and burn the earth in one hour. That will be the result of all-out nuclear wars among the war-raging, God-worshipping religions. The wars in that fourth part of the earth around the great River Euphrates (verse 14) have already started. That Prophecy was written in 96 AY (After Yahshua). A third of mankind will die there in those wars; yet, the 4,199 religions still will not repent (verses 20-21). Those wars will turn nuclear. Notice in verse 2, the word priest, which means the leader of that or each religion. The nuclear wars will burn the earth in one hour. Keep the following in mind about the religion that is located on the seven hills of Rome. It’s the leader that is leading or setting it up to pull all religions into this nuclear burning, while pretending to try to stop the wars. Verse 9 shows the location: 7 hills, the seven hills of Rome. Nuclear development, which started in 1934, has come to the mass burning power of 2018; it will be used to burn the earth. 2018 in the Hebrew numbering system means destruction and overthrow. 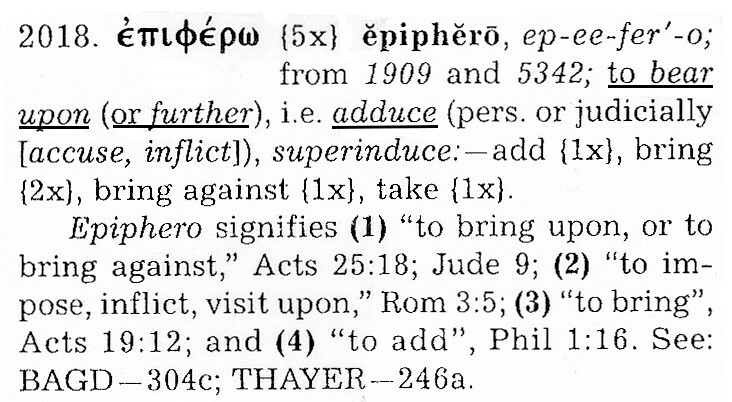 2018 in the Greek numbering system means to bear upon (or further), adduce (personally or judicially accuse, inflict), superinduce, add bring against, and take. The following information is from Strong’s Exhaustive Concordance and Webster’s Dictionary. I hope you noticed the number 2018 in Greek shows “the leader” (adduce), who is leading all 195 nations to destruction. Yahweh the Creator, the same Being who foretold about the bombs, the wars, where and when they would start, and the generation, also foretold of a place of protection for those who will reverence Yahweh.